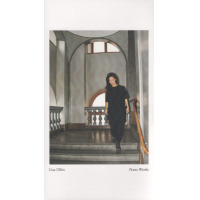 Pianist Lisa Ullen has followed her muse big time with Piano Works, a three-CD box-set of unaccompanied pieces, recorded in 2017. A native of South Korea, Ullén grew up and lives in Sweden, where most of her activity remains centered. She may be best known for her work on Anna Högberg's Attack (Omlott, 2016) and the collective foursome Festen (Clean Feed, 2016), but her discography goes back to 2006 with the first of several dates for her Quartet, which includes trombonist Mats Alekint, issued on her own Disorder imprint, and also documents a long-standing collaboration with bassist Nina de Heney. Although the title of the box suggests compositions, listening reveals constructs which often have the open-ended unresolved feel of improvisations. Each disc comprises a number of shorter pieces, under five-minutes, almost miniatures in some cases, and one longer track around the ten to thirteen-minute mark. Ullén takes a measured approach at the cusp of improvised music and contemporary classical, with silence also a big player. Cecil Taylor and John Cage might provide touchstones, but what Ullén does cannot be confused with either. An air of mystery pervades the three discs. Ullén conjures a rich drama from basic but abstract materials which avoid overt melody or sustained rhythm, denying easy emotional connotations. She often shows herself fond of the bass register as on the rousing "streets," where a galumphing figure alternates with more fluid runs, or "hollow part 1" where she makes the piano resonate with dark sonorities. Ullén exploits her considerable two-handed independence unostentatiously, exploring the contrasts between the opposite ends of the keyboard in "the gap one." At times, those contrasts can be seen as a stretched-out call-and-response, but elsewhere she layers and juxtaposes the different elements. Her under-the-bonnet excursions on prepared piano form especial highlights. On the extended "specter" she fashions a doomy, atmospheric ambience from humming strings, dampened keys, echoes of gamelan and tolling notes. Similarly on "yesterdays" she creates enthralling theater from abrupt gestures amid shimmering strings evoking a metallic harpsichord. The final twenty-two-minute disc, entirely performed on prepared piano, is brooding and enigmatic, embracing keys plopping like raindrops on "hollow part 2" and lurching, music-box formulations on "hollow part 6," via a rippling legato which edges into the prepared sections of the keyboard, interspersed with ghostly notes, odd pauses and harp-like tones on "hollow part 4." Although a deeply personal set, it is not entirely introverted. It is easy to imagine some of Ullén's lines as acerbic and bracing contributions to larger group exchanges. And through it all resides the sense of a fiercely-focused intelligence at work. Track Listing: CD1: link; up north; wood; needle; streets; uphill; the gap one; specter; step; layer; CD2: the gap two; treble and bass; the place; writhe; yesterdays; glow; apparition; chair one; chair two; psalm; CD3: hollow part 1; hollow part 2; hollow part 3; hollow part 4; hollow part 5; hollow part 6. Personnel: Lisa Ullén: piano, prepared piano.